Years ago, we used to sometimes go to Mill City Cafe for breakfast. It was an unassuming coffee place with full breakfast, and the eggs are cooked on a stove and not steamed in the espresso maker, which is an unspoken requirement for all coffee-places-turned-breakfast-joints, at least for this overly-particular crowd. And, of course, when I say "unspoken", I really mean loudly repeated whenever one of us suggests a place with coffee or cafe in the name. Mill City also sports probably the best breakfast patio in town. Today, however, in our fair city, it's nearly 20 degrees below zero, and the patio played no role in our decision to try Mill City again after a long absence. 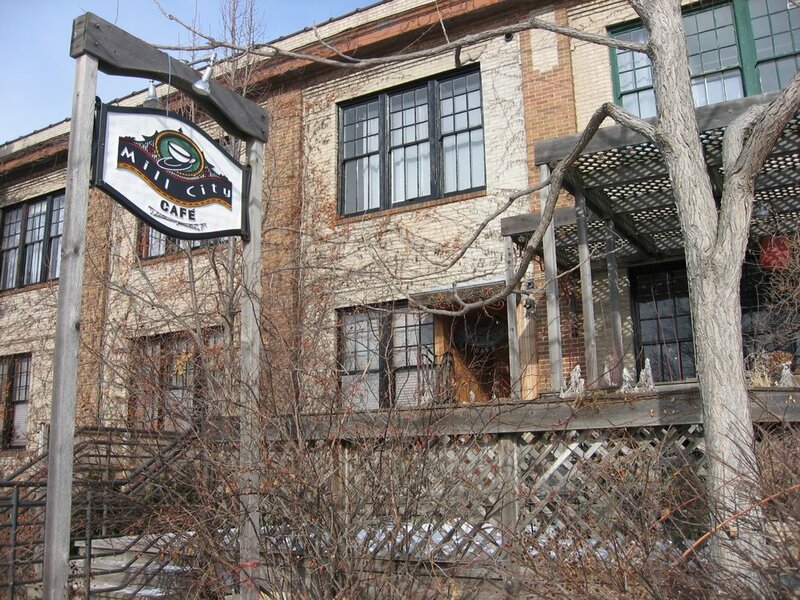 We were driven away from Mill City Cafe all of those years ago by live coffee house music. I'm not the best judge of the quality of music (listen to me sing all three songs I know all in the same one note with approximately the same rhythm, and you will know why), but I do know that in a place the size of Mill City, the music intruded on our conversation. Today, the place was blessedly quiet. Mill City has also received a face-lift. It's classier now. A little less unassuming, and more like the kind of place you might bring a date. The menu is about the same though: Chorizo Breakfast Burrito, Biscuits and Gravy, and Quiches of the Day. Poor Fern wanted her usual breakfast burrito. We all saw it on her face, but she forced herself to get something else to prove to us that she didn't. Beau and Rachael both got it, and the two of them seemed the happiest of all of us with their meals. Judy and I got two of the quiches and we agreed that while the light, flaky phyllo-type crust was delicious neither filling particularly thrilled us (mine had artichokes and mushrooms and Judy's had asparagus and bacon). The only really bad thing about the meal were the potatoes. They were sad little roasted potatoes, dry on the inside, and soft on the outside, even the few of them that looked brown. All of us who got potatoes left some of them behind. We're a family who cares about the quality of our potatoes, and I predict that we will not be back to Mill City until one of those rare summer mornings before the wasps come when we can eat on its lovely patio. The group grade hovered around a B-. Not bad. Nice atmosphere. Nothing to write home about, but we did leave with full stomachs and we didn't have to wait for a table. In the Phone Book under "A"